Two years ago on Father’s Day we took our beautiful child to Sick Kids in the evening. We were worried, concerned, alarmed. But we had no idea that the tank headed towards us was about to flatten us in its tracks. The innocence of the time before is something I’ve longed for in the past two years. 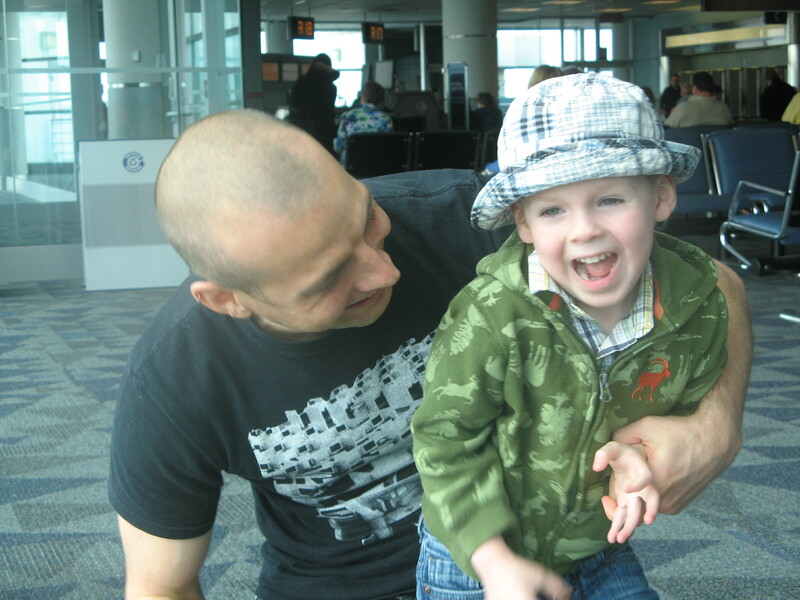 There have been times that I have felt physically sick thinking about the day of Gavin’s diagnosis, wishing I could unhear the words, “Gavin has a brain tumour,” that Craig had to whisper in my ear in the ER, as I returned from getting a coffee. Yes, my memories of that day are dark. It was the day that altered the course of our lives forever, but it was also the day that we knew. So, it was also the day that we began the fight for Gavin’s life. Now, two years later, it is the day that we continue to celebrate our triumphs. With a clear scan in his pocket, Gavin can look forward to a sun-splashed summer and the excitement of starting school come September. Craig’s Father’s Day gift this year has arrived one day late. This evening, we took the Bean to Bloorview for his swallow study test. Daddy was by Gavin’s side in the x-ray room whilst I watched from behind the lead-lined wall. I could see the x-ray image of his little neck as he swallowed the barium-laced drinks prepared for him. He passed the test, absolutely and unequivocally! This means he is cleared to drink water, apple juice, beer and wine. Okay, we’ll wait a few years on the last two. We are dizzy with relief and excitement. He can now take a drink from the water fountain at school! He can accept a juice box if someone offers him one! These things are huge in a child’s life. Gavin has never really complained about having his drinks with “magic powder”, but eventually he would’ve been made to feel different at school. This news is liberating in so many ways. Up until now, Gav has not been able to help himself to a drink. If he asked for water in the middle of the night, one of us had to march downstairs and mix up a drink for him. If we were out somewhere and had forgotten the thickening powder, we would either have to deny him a drink or worry that he was aspirating whatever we were allowing him to drink. Those annoyances and fears are now behind us. Of course, we’ve been warned to remain cautious. But we are always cautious, so here’s hoping his “beautiful swallow” as the doctor called it tonight, continues to be beautiful in every way.